More worrying is the fact that slow productivity growth has now persisted for almost a decade, and that this development hasn’t been restricted to the United States. Something similar has happened in countries like Japan, Germany, France, and the United Kingdom. Whatever is driving the slowdown in productivity growth appears to be affecting the advanced world as a whole. What is it? The bigger issue is that many corporations aren’t seeing enough demand for their products to justify large new investments. And even when they do see an uptick in demand they hire new workers who have to make do with existing equipment. So employment growth looks healthy, but the economy remains stuck in a low-growth, low-investment, low-productivity trap. If this is what’s happening, there isn’t anything wrong with new technology, or the economy’s capacity to grow: the issue is how exploit its potential. If higher demand could be sustained, perhaps through a fiscal or monetary stimulus, firms would step up investment, and the economy would return to a more virtuous circle, in which higher rates of productivity growth and G.D.P. growth reinforced each other. This is basically what happened between 1945 and 1973. On the other hand, as mentioned earlier, the recent decline in productivity growth (and thus in potential output) has been both large and mostly unexpected. Some have hypothesized that this decline is not purely exogenous but has been influenced, to some extent, by short-term economic conditions. For example, the slow recovery from the Great Recession likely impeded capital investment, business formation, and the acquisition of skills and experience by workers, which in turn may have contributed to the disappointing pace of productivity gains. The converse possibility, that stronger economic growth today might have positive and lasting effects on the economy’s ability to grow, is for some an argument for erring on the side of more stimulative policies. The charts provide an illustration of the importance of the stability and growth level of demand (NGDP) for the productivity growth outcome. What to do? When faced with a decline in productivity, economists typically offer so-called supply-side solutions, such as lowering taxes or eliminating regulations. It’s important to recognize, though, that policies aimed at stimulating demand might be able to help a lot. Suppose, for example, that macroeconomic policy choices convinced businesses to expect faster growth in the demand for their goods and services than they currently do. Companies would react by investing in more physical capital, and in the innovation needed to make that capital (and the people who work with it) more productive. 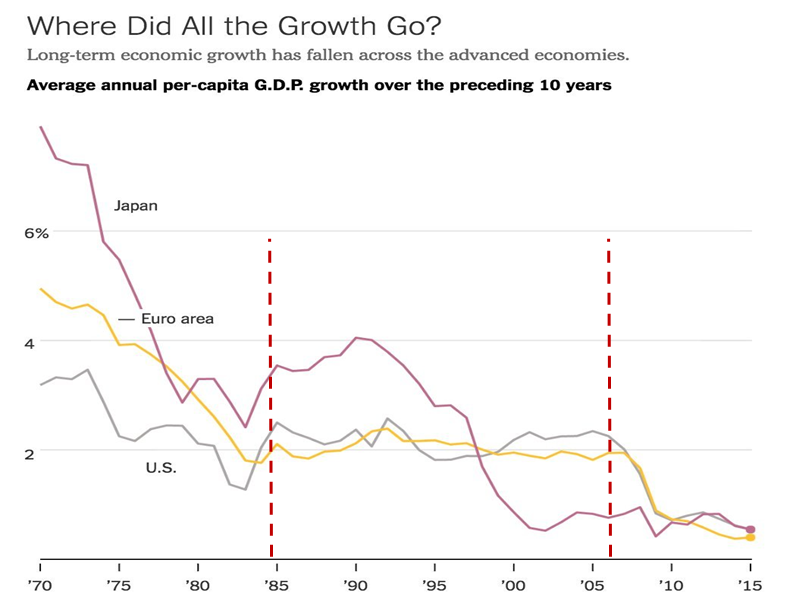 One central fact about the global economy lurks just beneath the year’s remarkable headlines: Economic growth in advanced nations has been weaker for longer than it has been in the lifetime of most people on earth. He certainly could have done a better reading of the evidence. First of all, the very high (but falling) average growth, especially in Europe and Japan before 1980, is a reflection of the catch-up growth following the end of WWII. 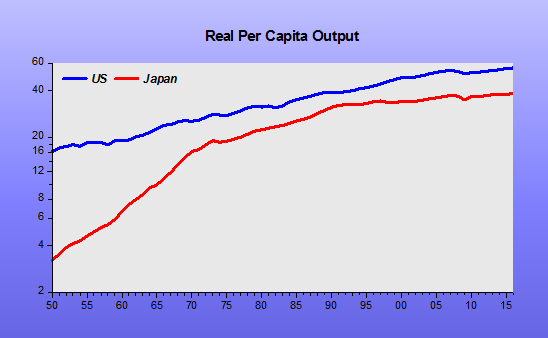 This can be clearly seen by comparing real per capita output in Japan and the US from 1950 onwards shown in the chart. By the early 1970s, Japan´s catch-up growth petered out. After 1990, per capita growth almost completely disappeared. 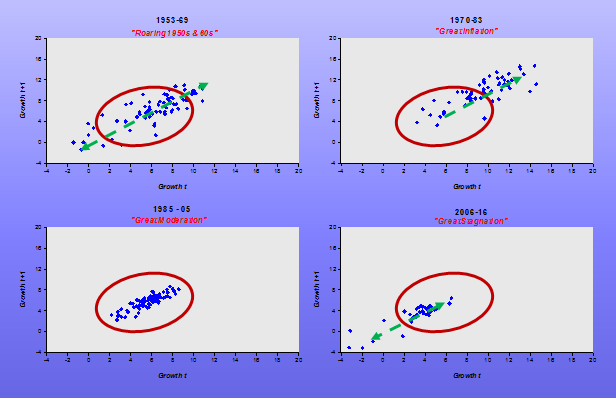 In Irwin´s chart we see 10-year average annual growth in Japan falling off steeply. Meanwhile, observe that per capita growth in the US and Europe during the period between the two vertical bars (“Great Moderation”) is very stable and only falls off fast with the onset of the “Great Recession”. In that sense, the low per capita growth phenomenon is “new”. What happens when we look at real per capita growth for a long span of time. For the US the table gives the summary statistics for growth over 1850 to 2015. During the Great Moderation (1985 – 2006) real per capita growth was the same as the previous 156 years, but growth volatility (Standard Deviation) was lower by a factor of 4, a much more “pleasant” life experience. During the recovery that began 7 years ago, it is growth itself that was reduced by a factor of almost 4. At times during the long period of 2.1% growth, we observe periods of deep penury. For example, in 1934, in the midst of the Great Depression, the average annual 10-year per capita growth reached a minimum of -0.9%! Then, that was the result of a massive monetary error. You wouldn´t be off to conclude that the steep drop in per capita growth at present is also the result of a less massive, but more persistent monetary error. From looking at Irwin´s chart, it almost looks like “everyone wants to be Japan”, a risk Bernanke himself warned about as far back as 1999. Friday’s employment report clears the way for the Federal Reserve to raise short-term interest rates by a quarter-percentage point at its Dec. 15-16 policy meeting, ending seven years of near-zero interest rates. 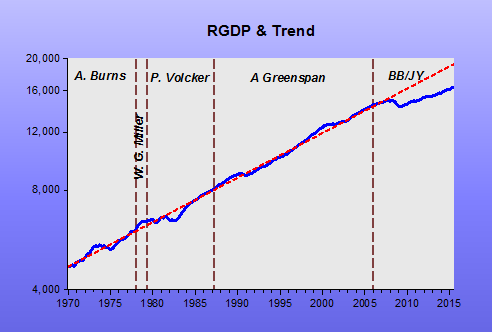 The Fed can reasonably well control nominal spending (NGDP) growth. 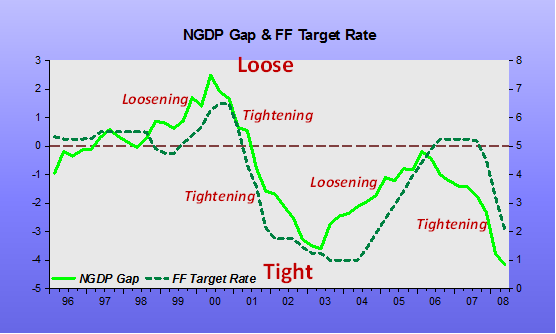 Stable NGDP growth at the appropriate level well defines what good monetary policy is supposed to look like. Throughout the period, inflation was not a problem. By the mid-1990s, it had reached the “low and stable” target of the time. Ironically, after the numerical 2% target was set in January 2012, inflation has languished, but is still “low and stable”! But if you zoom in on the past 15 months, things seem “fishy”. 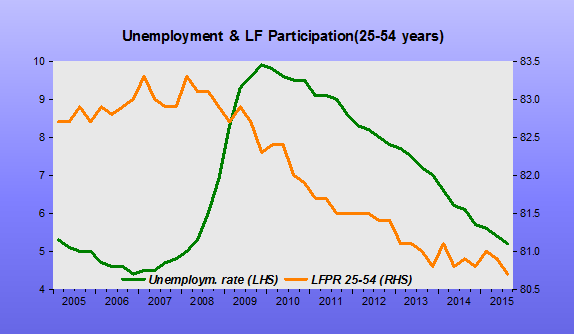 For all the Fed´s “communication”, the truth is that they have been tightening policy. 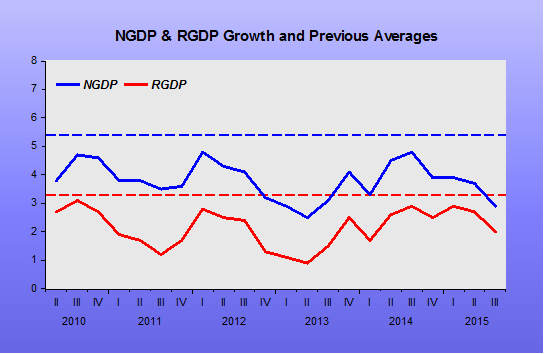 NGDP growth is coming down which was shortly followed by decreasing employment growth. Won´t even mention inflation. 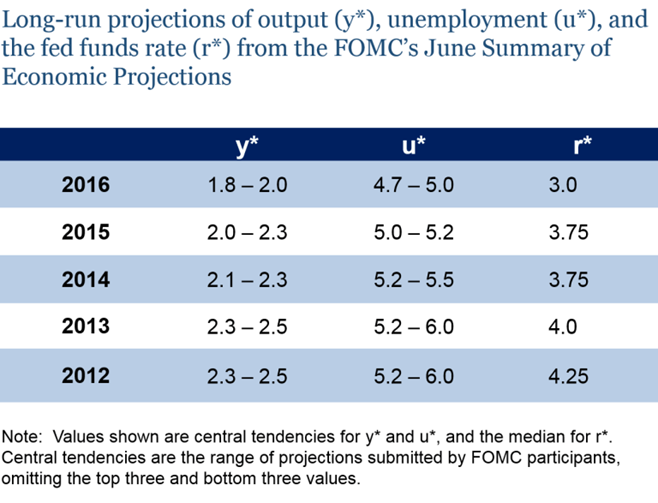 To wrap up, where´s the much touted wage growth-inflation nexus so cherished by some at the FOMC? Great harm might be on the way! a central bank that allows the overall volume of spending to collapse has blown it, no matter how much emergency lending it undertakes. Indeed, to the extent that a central bank engages in emergency lending while failing to preserve aggregate spending, it may be guilty of compounding the damage attributable to the collapse of spending itself with that attributable to a misallocation of scarce resources in favor of irresponsibly-managed firms. 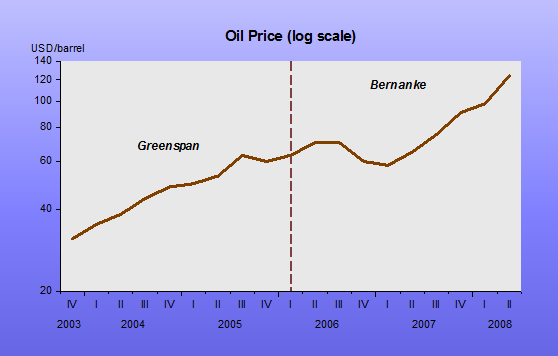 No visible difference in the behavior of inflation, which remained closer to “target” during Greenspan´s last decade. 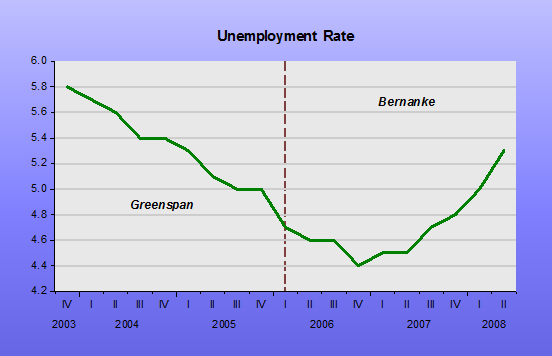 There´s a big difference in the behavior of unemployment, much lower during Greenspan´s tenure. The defining difference is in the behavior of nominal spending (AD or NGDP) growth, which translates into a significant difference in the growth of real output. 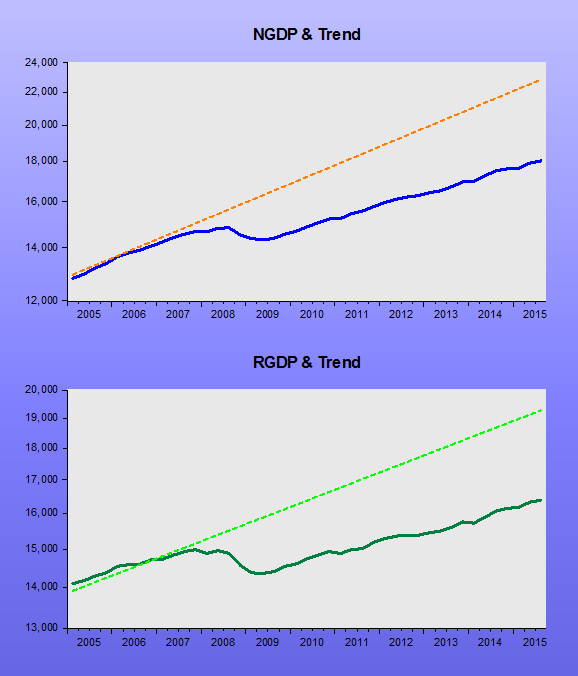 Note than in 2001, when Greenspan allowed NGDP growth to drop below trend, unemployment goes up and stays up until NGDP growth returns to trend. 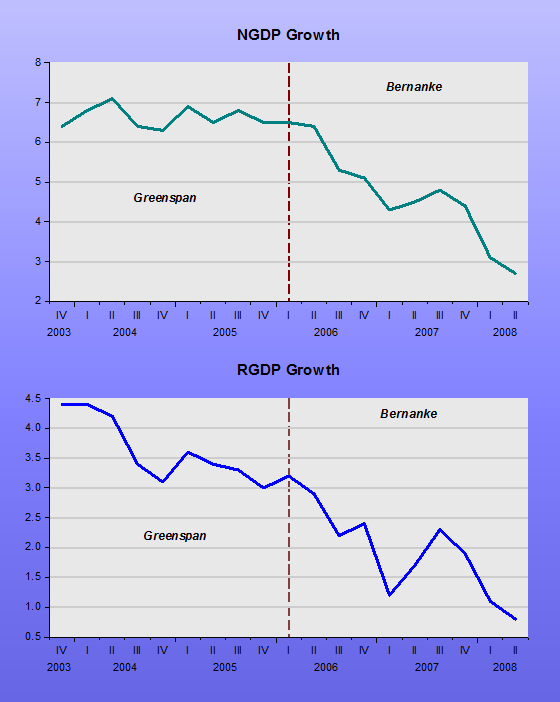 In 2008, unemployment soars when NGDP growth tanks and becomes negative. The yellow bar shows that when NGDP growth stops falling, unemployment “levels off”, beginning to fall when NGDP growth becomes positive once again. Unfortunately, the Fed this time around chose an inadequate level of spending growth. The result is that the economy got stuck in a “Great Stagnation”, defined by a level of real output and employment well below the previous trend level! To get out of this trap, the monetary policymakers have to start thinking outside the “interest rate box”! From all the nonsense we hear from them, that is not likely. In an environment of little or no inflation, why devote so much time and intellect to the study of inflation? Since controlling inflation is a central monetary policy goal, monetary policymakers focus intently on inflation signals. But they face a major difficulty: inflation data contain a lot of transitory shocks. The presence of the transitory “noise” in inflation data makes it difficult to detect early warnings of sustained movements. 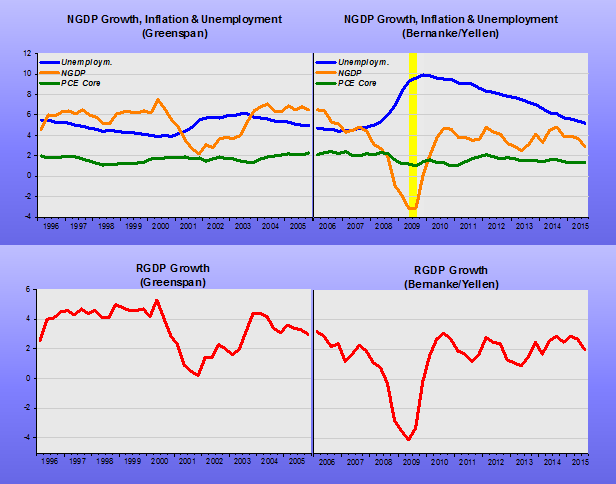 Responding to these transitory shocks would be a bad idea[wasn´t it Bernanke? ], because doing so would translate into policy swings and reversals and introduce uncertainty and volatility into the economy. 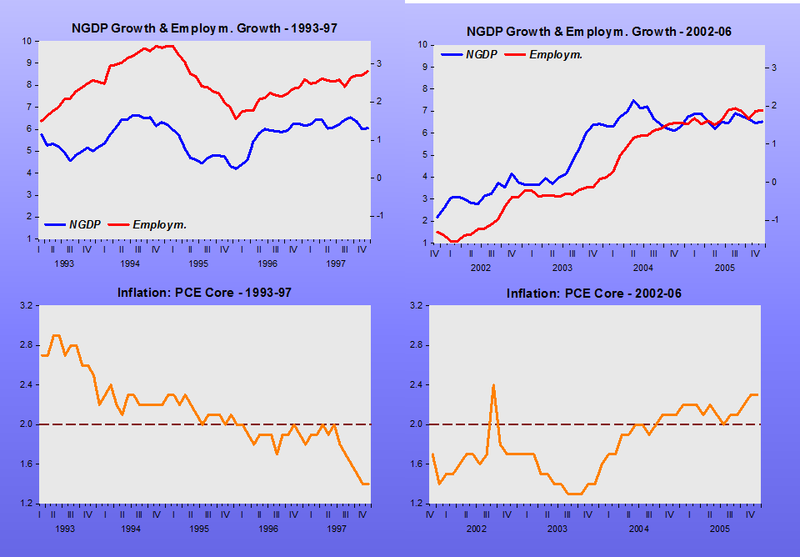 Instead, policymakers attempt to respond to the sustained movements in inflation—that is, to underlying trend inflation. Discerning the underlying trend in the midst of the noisy inflation data is a challenging task. We should not forget that inflation was only conquered when it was acknowledged that it was a monetary phenomenon. 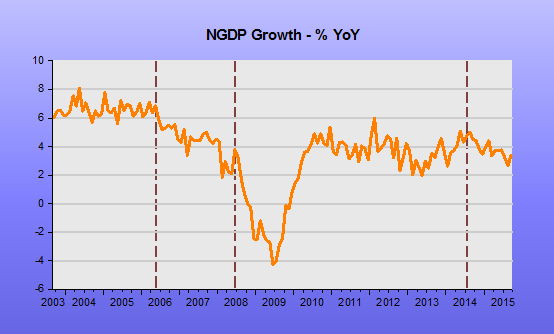 spending (NGDP) growth. 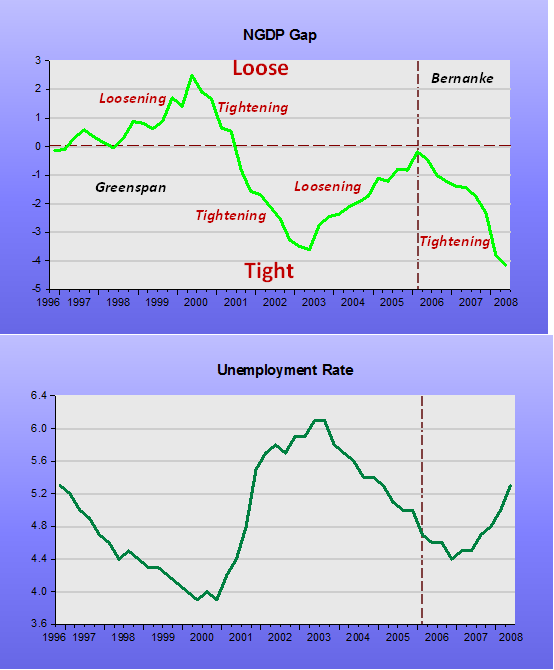 The second illustrates that down trending inflation is “attached” to falling nominal spending growth. 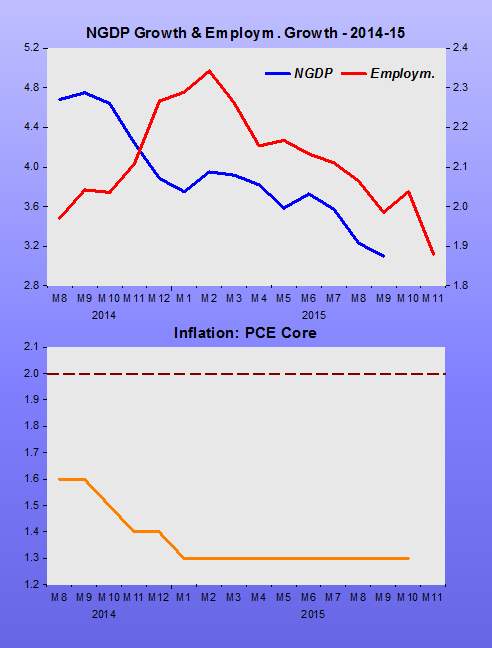 Thereafter, inflation was falling, low and stable, “strolling” hand in hand with stable nominal spending growth. In 2008, however, NGDP fell into a deep hole. The inflation damsel, however, was “rescued”. Who saved her from dropping in the abyss? Most likely that was due to the credibility of her “best man”, the Fed. What that tells us, is that the Fed should be paying attention, not to inflation, but to NGDP, constantly checking to see if it is travelling along the ideal (level) path. The charts below indicate that it is not doing so, having chosen a path that is much too low. 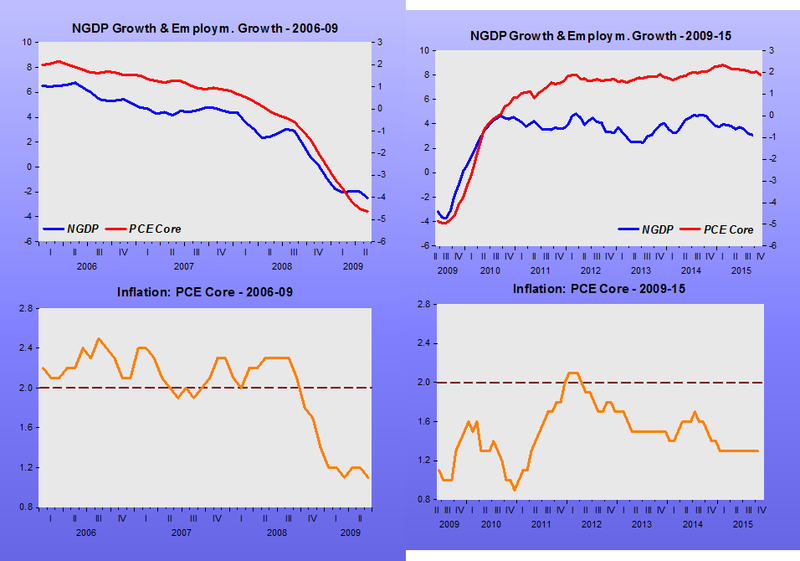 Inflation doesn´t really care along which level path nominal spending is travelling, as long as it´s a stable path. The real economy, composed of consumers, businesspersons and workers, flesh and blood characters, cares very much indeed! 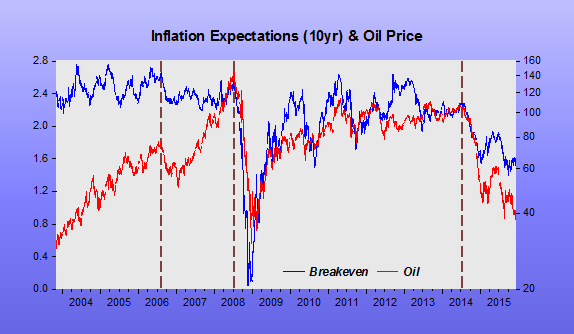 Observation: Note that in the 1970s, core inflation “reacts” to oil prices. In the 1990s and 2000s, it doesn´t. 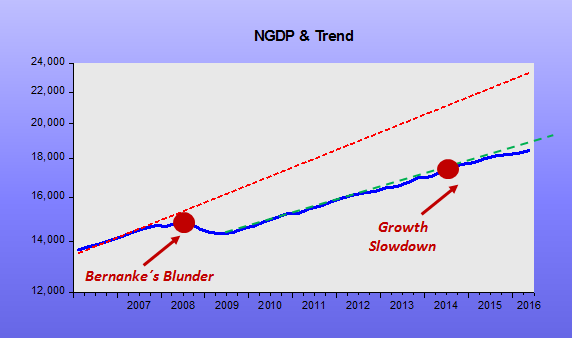 That´s the difference between an upward trending and a stable NGDP growth! Unfortunately, Bernanke who had even written about this back in 1997 fell into the trap!